Les McNaughton served over 24 years in the British Army with the Household Division. He has training experience in North America, Central America, Africa, Asia, Middle East and Europe during which he worked closely with foreign governments. Les was College RSM and an instructor at the Royal Military Academy Sandhurst. In 2008, he was the training and security advisor for the National Defence Force in Male, Maldives. Les has conducted operational deployments worldwide with his battalion. Les has a diploma from the Chartered Management Institute, City and Guilds NVQ in Training and Development, a graduate from the LE Officers Course Royal Military Academy Sandhurst, and security officer at the Defence College of Intelligence. 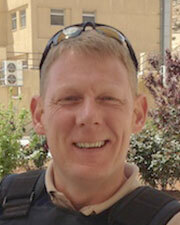 Les was previously the Close Protection (CP) Manager and lead on the Hostile Environment range package. In 2010, Les was awarded the Meritorious Service Medal (MSM) in the honours list. Les is a keen sportsman, enjoys rugby and football, and was an expedition member to Everest.